There is growing evidence for culture in animals other than man. As a matter of fact, those inclined to evolutionary thinking have little doubt that many roots of human culture are found in non-human animals. Culture is another hot topic often thought to be uniquely human. Definitions of culture are heatedly debated by scientists and philosophers and it seems that agreements between the parties are not progressing much. Not much point arguing with those that hesitate to contemplate that the differences between man and other animals are of degree rather than kind as put forth by Charles Darwin (1878). 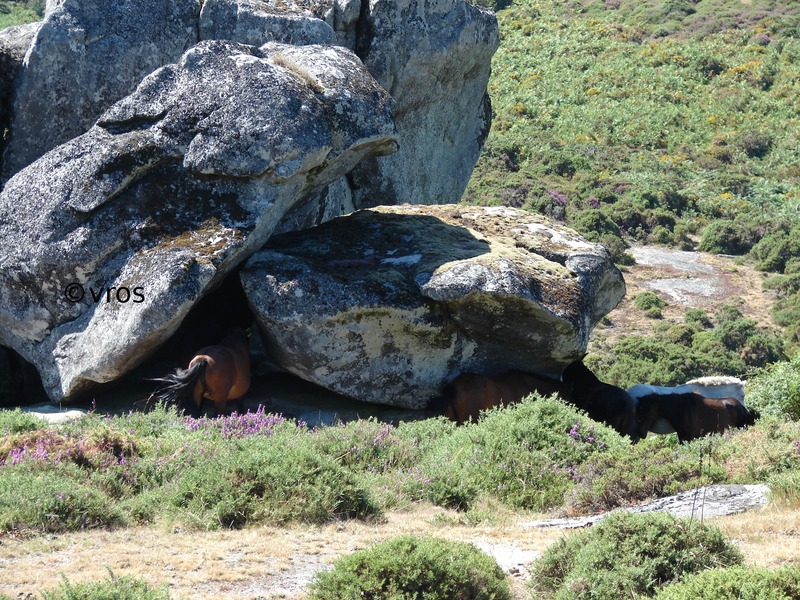 Ths particular group of free ranging horses in the Galician mountains seek refuge in rock formations. Following the definition above, it should not be surprising to learn that culture was once considered a purely human affair, but in fact is not uniquely human at all. Many forms of group living organisms, from fish to mammals, have some form of culture of their own. The typical textbook example of culture in non-human animals is the sweet potato washing by Snow Monkeys or Japanese Macaques (Macaca fuscata), first described by Kinji Imanishi in the 1950’s while studying the primates in the Koshima Islet of Japan. Imanishi who predicted that culture should be present in all socially living animals, observed a female he later named Imo, wash dirty sweet potatoes and wheat in water to remove sand. This behavior never before recorded was socially transmitted to members of her troupe as well as to their offspring. Interestingly, Imanishi studied feral horses too! But it’s not just our closely related primates that have culture. Cetaceans, which include whales, dolphins and porpoises, have been found to possess forms of culture by way of dialects in whale song, different group strategies for hunting or foraging, or even dietary preferences. Polly wants a cracker? Many of us will be familiar with the capacity parrots have of imitating sounds. Most species of Parrots exhibit complex social behaviors which are imitated by group members. Groups of Parrots are also known to have between group difference in song, foraging strategies and dietary preferences. Songs of many birds such as starlings, cowbirds and sparrows are learned from others. Even Guppies (Poecilia reticulata) have been shown to show cultural transmission through mate choice, whereby females tend to copy other females in choosing their preferred mate. Lee Dugatkin, found that if one female likes a particular mate, then other females will take notice and “date copy”, which is to say that females will choose males that attract other females. However, I’m not convinced that the examples given (except those involving cetaceans) denote culture. Perhaps like pattern recognition, which is an evolutionary pre-cursor to language and logic, these examples do reflect an evolutionary arc toward human evolution. So while the trope that “the difference is one of degree not of kind” has become a kind of mantra in cognitive science, it’s not an entirely accurate reflection of Darwin’s thoughts on the matter. Thanks for your comments Lee! I see where you are coming from, and I understand what you are saying. I do agree that care must be taken when using the “degree over kind” analogy, but it does not make it less likely to be so in the case of closer evolutionary histories.